Hillsboro’s Karleigh Hopkins guards Jackson’s Katelyn Webb on Wednesday at Jackson High School where the Lady Indians took on the Lady Ironmen in FAC varsity girls basketball action. 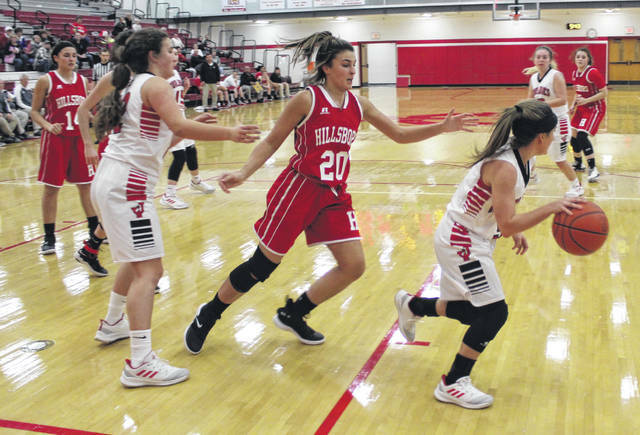 Hillsboro’s Lady Indians varsity basketball team traveled to Jackson on Wednesday to battle the Lady Ironmen in Frontier Athletic Conference play and lost 36-31 despite a stellar defensive performance in the fourth quarter that limited Jackson to only two points. The win snaps a 16-game losing streak for the Jackson ladies that dates back to December 23, 2017 when they beat the Chillicothe Lady Cavaliers. Hillsboro and Jackson each got off to good starts offensively with both teams scoring in double figures in the first quarter and Jackson leading 13-11 at the end of one. The Lady Indians took their first lead of the game in the second quarter at 14-13 and then exchanged the lead with the Lady Ironmen two more times in the period at 16-15 and 17-16 respectively before trailing 19-18 at halftime. Karleigh Hopkins hit a three 40 seconds into the third quarter to give Hillsboro its final lead of the game at 21-19. The Lady Ironmen then went on an 11-0 run that resulted in their largest lead of the night at 30-21 with 3:10 left in the third quarter. Hillsboro followed up with six straight points to make it 30-27 two minutes later. However, the Lady Indians were unable to get closer than five points the rest of the way at 32-27 and 36-31 with 1:38 left. The Lady Indians have a week off before their next game on Wednesday, December 12, when they travel to Miami Trace High School to take on the Lady Panthers in another FAC matchup.